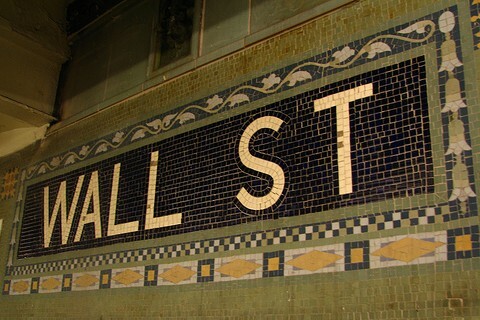 Are Crappy Startups Wall Street’s Fault? 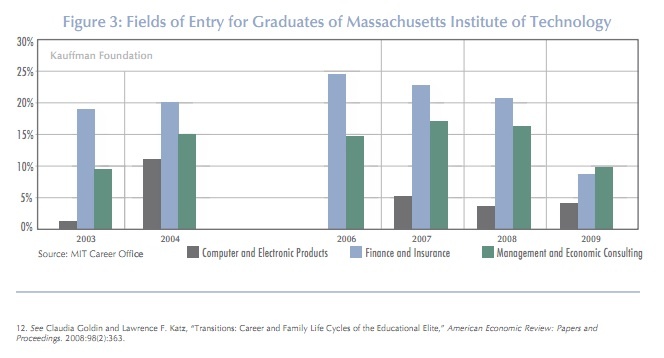 As the data on MIT graduates and the sectoral share of science and engineering employment suggest, it is conceivable that some degree of talent allocation between entrepreneurship and employment was affected by the rise of finance. Recall Figure 3 [shown below]: If we presuppose that some fraction of those scientists and engineers working in the financial sector would otherwise have started companies, we can imagine perhaps a slight effect of financialization on potential entrepreneurship. This also points to a question of the quality of companies being started, which we discuss below. It is difficult, again, to make firm statements as to causation, but the historical data seem to suggest that a two-way feedback effect exists. Financialization could have a suppressive effect on potential entrepreneurship by draining away human capital. Conversely, an underlying decrease (or, at least, not an increase) in entrepreneurship creates a shortage of new financing opportunities for the financial sector, meaning the sector must find other outlets in which to be innovative and make money from money—causing the sector to expand. The report acknowledges its drawbacks; for example, it draws causation from a variety of factors hugely affected by outside variables, from the overall economy to generational shifts in views about entrepreneurship. It also relies heavily on data from 2006 or earlier, which omits the impact of the latest bursting of the financial bubble as some of that innovation in finance resulted in the mortgage crisis. The study also looks at the rate that science, engineering and math (STEM) graduates have moved into the financial sector as opposed to starting companies. The report’s primary argument is that Wall Street pay is so monumental startups don’t really have a chance to recruit the best and brightest of the so-called STEM graduates. This can make it difficult for startups to find more employees, which affects the overall quality of the startups. Here’s where I think the survey breaks down a bit: It equates STEM graduates with the pool of founders. Many startups today are created not only by those in the so-called STEM fields but also by liberal arts, business and other graduates . I’ve written before how simple it can be to create a “startup” with little code and access to someone’s cloud platform. I don’t think these startups are out to create a business necessarily, so I don’t think they are the audience that the Kauffman report is talking about, but it’s also true that some of those startups will become a business. Plus, even for those that start out in a STEM degree program, history is littered with college dropouts who go on to build huge companies. Yes, the debate between dropping out to start a business or stay and graduate continues to rage, but I think the survey misses a crucial point about entrepreneurs: For most, starting a business isn’t a career choice; it’s a calling. Thanks to an idea, a passion, a strong desire to never work for anyone else, most people start companies because they can’t do anything else. Typically, those founders create the strongest companies. If they fail, they’re still likely to go back and try again. So while I can buy into the argument that there are a missing generation of scientists, mathematicians and entrepreneurs ready to join startups because they were lured by Wall Street’s high-pay, I can’t buy that there are many entrepreneurs among that crowd that have forsworn building their own business for the sake of a gilded paycheck. So yes, Wall Street may be taking away prospective employees, but perhaps a wider base of engineering and science talent would help solve the problem? Maybe our immigration programs should be revamped, or perhaps a greater emphasis on science and math will pay out in more children choosing to go through those degree programs. The report concludes by imagining what would happen as the financial sector becomes a smaller proportion of the gross domestic product. Its authors conclude that not only could entrepreneurship rise, but the quality of companies will improve and then through the growth of those new companies, financial services will be available to meet their needs as opposed to creating bizarre financial instruments that seem to be the equivalent of shell games. It’s likely that we’ll soon be able to test that conclusion. Picture courtesy of Flickr user epicharmus. I tried for 18 months to get a startup going, but no one would give an Berkeley masters graduate a loan with no experience. Some projects (education) can’t just be started on sweat and penuts, but require real investment. I now work at one of the big four because I was only able to afford one meal a day. Now I do well, but long to get back into the startup scene. I actually saw this happen with a number of my CS classmates at MIT at the beginning of the last decade – you have to remember that when financial companies are wining and dining seniors they aren’t telling them how boring their jobs are going to be, they’re buying them 100 buck steaks and telling them about how fantastic there life in New York will be. You don’t figure out until you’ve already made the commitment that you’re working 80+ hours and are miserable and at that point you can’t imagine giving up your six figure salary for peanuts at a startup. I’ve had 2 friends burn out (both during the 2008 crash), travel for a bit and then come back to the tech scene though, so there’s hope. If a high paying job is all it takes for a founder to forgo starting a company, then they were never cut out to be an entrepreneur in the first place. I’m a scientist, mathematician, and entrepreneur, and I’m good at the first two at least (Google-Scholar me if you doubt it); it’s too soon to say whether I’m good at the third one (my company, CardVine, just opened to the public). The thought of working for a Wall Street firm fills me with ennui, if not outright loathing. Work for a huge bureaucratic organization? Or even a not-so-huge one with a rigid status hierarchy? On projects with negligible or even negative social utility, more likely than not? Wear a business costume every day? No thanks. A majority of start-ups fail in the first year, 95% of start-ups fail in the first 5 years. Google’s dont come around often. The difficult situation for start-ups right now is it has become more difficult to get a loan, that is where Wall Street may have played a role, but there are dozens more reasons for cautious banks. Interesting study. I dunno.. is somebody who would want a job working at a giant bureaucratic financial firm actually the kind of person who would put the sweat equity required of most startups? If they will take a paycheck for manipulating pieces of paper over creating a new product or service out of thin air, are they start-up material? Do you think founders are typically motivated mainly by dreams of wealth? While there are always exceptions (like, for example, Jeff Bezos, who started on Wall St), my guess for the answers to these questions is no. Ken, those are my main objections with this study, but it’s an interesting read nonetheless. I believe this phenomenon is a lot stronger in the UK than it is in the US. In the US, you have two big hubs, Wall Street and Silicon Valley. These are two completely distinct, both geographically and culturally. In the UK, you just have London, and the city hoovers up all the talent.